There are quite a number of provinces in Canada, these provinces exercise constitutional and statutory power and authority in their own right. Each province has its exclusive and inviting features that attracts tourists and visitors frequently. There are also organizations and institutions within each province that can help plan a successful trip and vacation. Each consists of many outdoor adventure platforms which includes: fishing, camping, lakes, mountains and other natural wonders, but they all have a unique feature particular to them. Canada has a lot of provinces which includes Alberta, British Columbia, Manitoba, New Brunswick, Newfoundland and Labrador, Nova Scotia, Ontario, Prince Edward Island, Quebec etc. For instance, British Columbia is the country’s most western province and characterized with some of the most moderate temperatures in the world. A very prominent city in Columbia is Vancouver which is a multicultural and multiethnic city consisting of diverse people and traditions. The external areas of British Columbia are well known for remote and beautiful islands. We have Alberta province which is famous for its ski and hiking activities. It is also a major supplier of crude-oil to Canada’s industry. Prominent cities in Alberta are Banff and Jasper, and they are home to two of the most beautiful national parks in North America. Also, there is the Saskatchewan province whose major industry is agriculture, but also engage in mining, oil production etc. Saskatchewan is best known for fishing, hunting and other outdoor related activities. It is recognized as one of the most beautiful provinces in Canada. We have Manitoba province which is the most eastern province; home to aboriginal and native people over a large number of years and they continue to instill great cultural effect on the province. Manitoba is prominent for being the polar bear capital of the world. Ontario province which is Canada’s most populous province, is well known for its beautiful forests, lakes, reserves, parks and their wine region. It is home to the Federal Capital Territory of Ottawa. Also, Quebec province which is the second most populous province in Canada, is known for its large French speaking residents and heritage. It has the largest land size. New Brunswick province which is one of Canada’s maritime provinces has major cities such as Fredericton and Moncton. We have Nova Scotia province which is known for its Celtic culture and also possess sea foods like lobsters and crabs. Prince Edward Island which is the smallest province in Canada, is best known for the delicious mussels and sea creatures found in surrounding seas and lakes. British Columbia is a distinct region which is an abode for different functions and activities. It comprises different secluded islands and land masses, interesting cities which provides an avenue for tourism and vacation, remote world class resorts, excellent museums and cultural edifices just to mention a few. For instance, there is a city called Vancouver in British Columbia, which is one of the renowned places that exist there. The city comprises of many things which includes beaches, parks and reserves, art and culture galleries, cool and serene environments and neighborhoods which enables visitors have a nice stay. However, the most interesting aspect of this area is the fact that, it is in close proximity to outside areas and regions particularly mountains, therefore one can go from city survey to mountain hiking in a jiffy. Its popularity stems from the fact that it has a large access to external locations. In addition to this, British Columbia is home to various locations for TV shows and movies. Hence, a lot of online personalities and TV celebrities reside there. In cases where there is a need to meet celebrities and stars, a visit to British Columbia, can provide an opportunity of a lifetime, especially for those seeking connection and contact with the movie industry. Also, British Columbia is home to various islands over 10,000, ranging from Vancouver Island to the Gulf islands to the very remote archipelago etc. An interesting fact is that, each of these islands are interconnected, and can be accessed by means of transportation such as a ferry. Also, these islands are home to a number of world institutions and bodies which includes a UNESCO world heritage site. British Columbia is a place to visit for people, who love doing outdoor adventures such that it has excellent and magnificent hiking trails and a number of ski resorts. Also, there are other outdoor activities for recreation which includes fishing, mountain hiking and biking, canoeing and boat-cruising, cross country skiing etc. Furthermore, positioned on islands in British Columbia are storms, and also an avenue to engage in surfing activities. There are instances where places in British Columbia are filled with surfers of different kinds and caliber, because the area provides them with a reasonable amount of snow and storm. In fact, from November, the town fascinates and draws storm watchers where they watch the storm slide off the shore, and it is always a beautiful sight to behold. In British Columbia, there are quite a number of things that can be done to make a stay worthwhile and enjoyable. There are various activities to engage in, places to visit, a lot of attractions, sight-seeing and also a lot of events to attend. British Columbia comprises untamed surroundings, friendly and enthralling neighborhoods and the only limit or restrictions to enjoying what British Columbia has to offer, is the visitor’s imagination or personality. British Columbia’s wide landscape and settings, welcomes a large means of adventure and survey and an experience of such sceneries, would leave unforgettable and indelible memories. A dynamic feature is that, adventure can be found on both water and on land. Presence of mountains provide explorers and hikers unprecedented opportunities to hike and engage in mountaineering. During the winter seasons, activities such as skiing can take place. The ecological system provides opportunity for a tremendous nature sighting expedition. Also, in British Columbia, it is possible to explore all arts and exhibitions because while British Columbia is renowned for its landscape setting, there are also places that enhance its culture, arts and historical background which includes museums, art galleries etc. There are a lot of centers that showcase British Columbia’s art and culture ranging from the busy streets to art studios and exhibition centers. To get a preview into the history of British Columbia, there are series of heritage sites and since it is also a norm for culture to be celebrated at different locations and areas in the province. There are a lot of attractions and places of interest in British Columbia. One can enjoy museums or take a sightseeing tour that focuses on wildlife, cultural heritage, culinary experiences, and even the dynamic and beautiful natural habitat the province has to offer. For instance, at Vancouver, a city in British Columbia, one can decide to visit any art studio, and see how artisans create and design everything from the scratch. In addition to this, it is possible to shop at markets and trading centers in British Columbia. The markets are open seven days a week, and it is possible to get souvenirs that are locally made and crafted. It is also possible to purchase food items that are locally prepared and sourced. Also, there are artisan sake tasting that allows people to participate in and have a thrilling experience. There are ceramic studios that could also be checked out. Medical tourism refers to an act of travelling, or going on an itinerant journey to another city or country, in order to seek medical attention and services that is not available in the present home or country. The demand of Medical tourism is expected to grow in British Columbia, because residents are beginning to embrace the benefits of medical tourism. Over the past few years, the cost of out-of-country services has increased significantly and as such government and provinces have begun to examine the implications and the disadvantages. Governments in British Columbia have sought out options to improve access to medical are for their residents. Visiting British Columbia for medical reasons might be due to cost implications that are experienced in other countries, hence making the city an attractive medial tourism destination for tourists and those seeking medical help. There are facts that prove that British Columbia is a place that offers maximum and easily affordable standard of care. For instance, there are more qualified medical personnel per population in British Columbia as compared to other countries. Reports show that there are 9.9 medical doctors or nurses for every 1000 people in the city. Hence, there are hands on ground to provide medical attention to people in need of it. Also, the average in-hospital treatment received by patients are nearly twice as much in contrast with other places. As such, British Columbia offers medical tourists, the most cost efficient medical services. In addition to this, little aspect of the finance is proportioned to administrative costs and more on the actual medical services provided, as compared to other areas and cities where more of the medical bills are spent on administration like paying salaries and running the hospital or medical center. Similarly, the mortality rate in British Columbia is on the high. Records show that the tendency to survive an ailment or disease is more, and this is a distinctive feat that has been achieved by the city over the years. The survival rate for a disease condition is at a high rate as compared to other cities. Equally, British Columbia records a large number of successful bone marrow transplants and surgical operations. There are particularly some disease conditions that there have been solutions to which includes kidney transplant, liver transplants, childhood leukemia etc. British Columbia is not just lovely and attractive, it possesses natural wonders that are captivating, and causes a sense of visual delight on sighting them. There are a lot of magnificent and fascinating edifices that can catch a visitor’s attention on a glimpse of them. Firstly, the Cathedral Grove which is home to a distinct forest with trees and vegetation that has stood for a long number of years; approximately 800 years. One of the trees known as Douglas Firs, measures about 8 to 9 meters in circumference, and tourists or visitors can just journey on an easy trail around the tree. It is located about 25 kilometers westward of Qualicum beach. Similarly, there is an extinct volcano called the Black tusk which is one of the most discrete features of Garibaldi Provincial Park. From stories passed down, it is said to have been a mountain where a mythical thunderbird hung on it, and was made black by the lightening that exhumed from the thunderbird. It is a sight to behold. Also, Burgess Shale which is a fossil field in Yoho National Park, is a place where researchers and scientists has found an element called trilobites. This element has existed for several years, 505 million years to be exact. The only possible way to have a glimpse of the area is on a monitored hike with an experience personnel. Likewise, Della falls which is a towering and gigantic water fall, is found to be the tallest in the whole of Canada. It has a height of around 440m, and can only be accessed by a 16 kilometer hike. It is most fascinating during early summer and the ending of the spring. In addition to this, Haida Gwaii which stands as British Columbia’s pride owns a unique set of plants and animals, such that some of them cannot be found anywhere else in the world. Some animals that exists there are humpback whales, dolphins, puffins etc. Some plants that exists there are the ermine and the pine marten. Furthermore, there are glaciers which are glass ice fields that fed water to several hydroelectric dams that generates electricity that feeds residents electricity and power supply. These glaciers are magnificent and extremely spectacular. The largest of all glaciers is the Klinaklini glacier which measures up 470 square kilometer. In addition, Eve Cone is a volcano which is black in color, and it is predicted to have been formed about 1200 years ago. It is symmetrical in nature and distinct from a flattened plateau. Whistler, British Columbia is a place like no other. There are not many towns that one can call a paradise in any season, but many would describe Whistler as exactly that. The outdoor recreation that one can find in Whistler is endless, and the town site itself is a gem for travelers. It was only in the last few decades that Whistler became developed and marketed as a prime ski town in North America, but when it did, it found itself on the map of tourist destinations in a big way. In 2010, the winter Olympics were held in Whistler and broadcast to the entire world. Anyone who has not already been to Whistler should do themselves a favor and plan a trip to see what all the commotion is about. The city of Whistler never would have become a destination for travelers if it were not for the outdoor recreation. The recreation opportunities in the mountains of Whistler are truly endless and attract outdoor enthusiasts from all over the world. In the winter, every type of winter sport is celebrated. Whistler offers some of the best ski hills and lifts in all of Canada, and skiers and snowboarders cover the mountain in the winter. Opportunities for snowshoeing, cross country skiing, ice skating and much more are also available. Summer activities include hiking, mountain biking with lift rides, riding quads, ziplining and riding gondolas to high views of the mountain range. The city of Whistler is built to accommodate people on vacation who are coming to the mountains in order to relax and play. Tourism put Whistler on the map, which means everything about the city is meant to accommodate tourists. The village center prohibits cars to allow for free pedestrian traffic. The shops are stocked with trendy, outdoor clothing. The restaurants are fresh and vibrant. The bars are packed until the wee hours of morning. The hotels and vacation rentals include everything a person may want for their comfort. Anyone vacationing in Whistler will quickly learn that they are there to be spoiled, as all the local amenities and services would indicate. It is impossible to have a bad vacation in Whistler. In the Okanagan Valley of British Columbia lies the city of Kelowna; the northernmost tip of the Sonoran Desert. In this hybrid region of desert and forest, where agriculture of all varieties flourishes, a vacation destination like no other has emerged. Qualified as the only desert in Canada, the climate is warm enough to host every type of summer recreation, but the snowy mountains are near enough to make Kelowna one of the most desirable ski destinations in Western Canada during the winter months. Outdoor enthusiasts flock to Kelowna for fully interactive nature vacations, full of sports, wildlife, scenery and adventure. The city is also home to some incredible tourist destinations. Foremost is the wineries and breweries that the ideal growing conditions create. Kelowna has officially surpassed Napa Valley as North America’s most desirable wine destination. The world’s elite travel from afar to sample the merlots of Mission Hill winery and the Pinot Grigios of Quail’s Gate winery. Nearby in the hills is the most dramatic system of railway trestles in British Columbia. Now retired, the tressles have been restored so that cyclists can ride along them for miles. The city is also a magnet for large music, sports, food and liquor events, such as the Keloha summer music festival, the Center of Gravity adrenaline show, the annual culinary competitions of Canada and the Hopscotch tasting event. Do not miss out on an another exciting season in Kelowna, British Columbia. The number of vacation rentals, timeshares and other hospitality options to make your stay in Kelowna comfortable are endless. Choose from mansions rented out by owners, private cabins on the outskirts of town, stylish condos in the heart of the city and high rise apartments that overlook the city and lake. Make your next trip an Okanagan vacation destination! Culture. The culture in Vancouver is some of the best in all of Canada. Vancouver is known for its vibrant music scene which produces musicians such as Sara McLachlan and Marianas Trench. Any Canadian who is trying to make it in the music scene ends up in Vancouver. It is a city that is known as an arts center for theatre, dance, literature and film. Nightlife. The world famous Granville Street and Gas Light District of Vancouver are places that every Canadian knows about. This section of Vancouver is famous for its party scene and night life. Vancouverites are known for their revelries and socializing. Events. Being the largest city on the west coast and one of the largest cities in all of Canada, Vancouver is a major venue for traveling events, festivals, shows and concerts. Large gatherings are held at one of the many venues in Vancouver that host crowds. Natural Beauty. 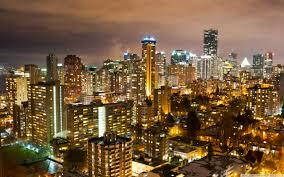 Vancouver is located on the coastline of the Pacific Ocean and has a temperate rain forest appeal to it. Though it is rainy a majority of the year, the city’s natural beauty is still stunning, complete with high mountains just inland from the city and miles of green coastline fit for kayaking or whale watching. Attractions. Local attractions in Vancouver are many, and include memorable stops such as a marine aquarium, expansive city parks, the historic gaslight district, the party environment of Granville Street and much, much more. British Columbia is full of treasures for travelers to take in, not the least of which is the city of Victoria. Victoria is the biggest city on Vancouver Island. It is the seat of British influence on Canada, complete with large, British style parliament buildings honoring the monarchy. 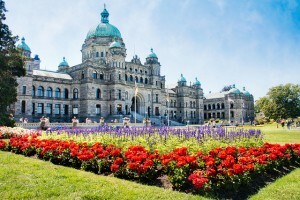 There is a great deal of history, beauty and other points of interest to take in when visiting Victoria. One of the most well known features of Victoria are its gardens. Victoria is known for its ideal growing conditions and temperate climate. The city is decorated with numerous gardens through out, some large and some moderate in size. The gardens and grounds outside the parliament building are perfectly maintained and include an impressive variety of flowers. The parks in the city also make for impressive garden landscapes with a variety of foliage growing along paths and waterways. But no gardens are more well known in Victoria than the Butchart Gardens. The professionally maintained Butchart Gardens are some of the most visited gardens in North America. The property is enormous and is home to numerous separate gardens, each with their own theme and plant species. 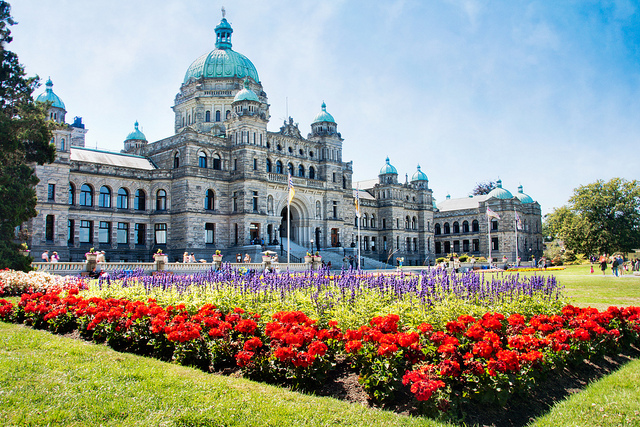 Another popular attraction in Victoria is the parliament building itself, which offers features such as a royal tea time in a proper British tea parlor and numerous exhibits. The grounds are also immaculately kept, with fountains and foliage displays around the entire structure. Victoria is located on a large Pacific island, so sea faring excursions are another huge selling point of coming to the area. Orca whales migrate just off the island, and whale watching tours are extremely popular. There is a wide variety of marine life to see off Victoria’s coast. Victoria is also home to exquisite private harbors and large communities of boating residents. Anyone considering a vacation who wants to surround themselves in elegance and natural beauty should find their way to Victoria, British Columbia.